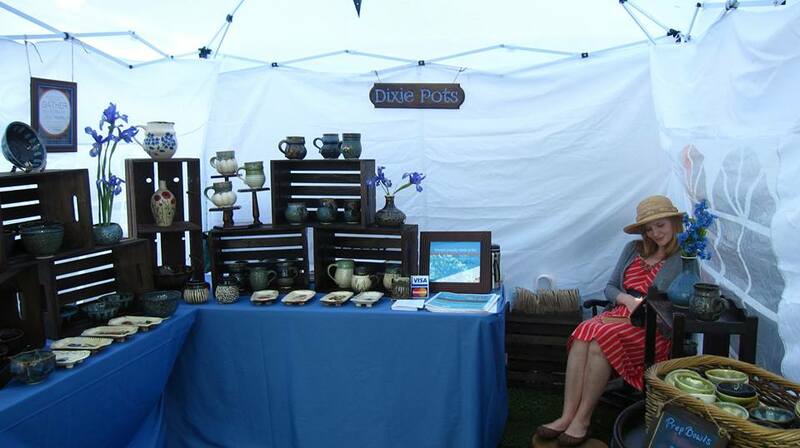 Potter Tamurlaine Dixie McLean Melby of Dixie Pots Clayworks joins us tomorrow at the South of the James Market. 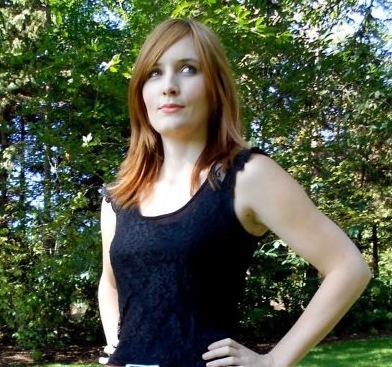 She creates functional, hand-thrown pieces for everyday use. 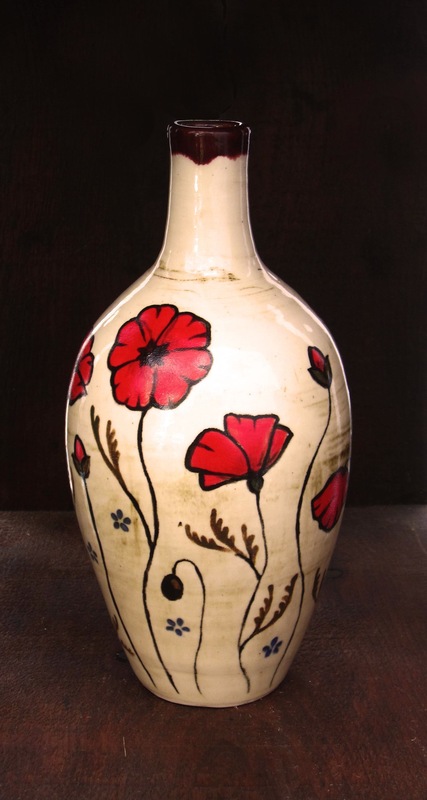 She works to make each piece unique and eye-catching through a combination of techniques, including form-altering, slip-trailing, hand-painting and carving. 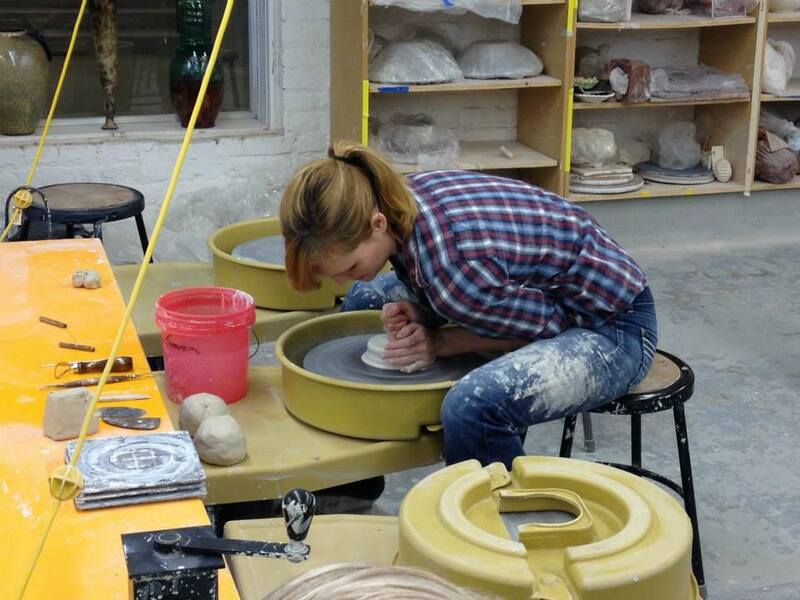 I began taking pottery classes at the Visual Arts Center of Richmond five years ago, as a hobby and a way to reduce stress. It’s a great studio with awesome instructors who encouraged me to look for places to sell my work, which I started doing this year. I spend a lot of time in the studio making pottery, but I’m also a freelance editor, so the rest of my week I’m working on a computer editing books and articles for several publishers/sites. When I’m not doing either of those things, I enjoy oil painting, cooking, writing, reading, yoga, porch-sitting with friends, and stalking Craigslist for antique furniture. Since college, I’ve waited tables and worked as a barista and in retail, but for the past six years I’ve worked as an editor and project manager with a small book publisher here in town, and I’ve branched out to do editing for other companies as well. What’s something about your business that people might find surprising? The name “Dixie” in “Dixie Pots” isn’t just a nod to the region–it’s the name my grandmother went by her whole life because she hated her given name (Frances) and had a soft spot for the South. When I was born, I was almost named Dixie, but my parents decided at the last minute to name me after a murderous Mongolian warlord instead, so Dixie is my middle name.